Ah, Valentine’s Day! A day for candy and cupids, hearts and flowers, dreams come true, and love that never ends. How romantic! Is that the music of violins I hear? Or the skeptical guffaws of those who know that the road to the land of happily-ever-after is full of potholes? Well, the skeptics have a point. In the quest for true love, even Princesses have to kiss a few frogs. My first frog’s name was Todd. He sat at a desk two rows distant from mine in Sister Judith’s second grade classroom. He had sandy blonde hair and big blue eyes that looked even bigger when he stared through the lenses of his wire rimmed eyeglasses. For reasons that escape me now, I was sure that Todd and I were destined for one another. Todd, however, was less convinced. Naturally, I’d made another for myself and could hardly wait to see how Todd and I would look wearing the matching bands that would announce our love to the world – especially to Mary Kay Munson who would be SO jealous. Imagine my heartbreak when Todd rebuffed my amorous advances and refused my ring. The hurt was deep and lasting, almost as deep and lasting as my fury when Todd told everybody about my proposal and his refusal, making me the laughingstock of the second grade. I was mortified. And bent on seeking revenge. For the rest of the year, I watched Todd with an eagle eye, noticing his every infraction of every school rule and making sure the teacher noticed too. It was my first experience with the pain of a broken heart and Todd’s first experience with the wrath of a woman scorned. Frankly, I think we both learned a lot from it. No, indeed, most of us don’t get much past the second grade without having our hearts broken in all kinds of ways. That is certainly true for the characters of my most recent novel, A SINGLE THREAD. 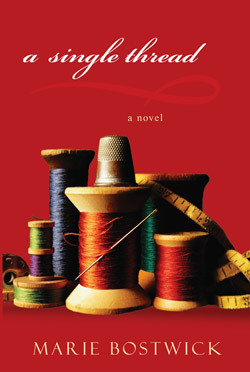 When Evelyn Dixon, a recently divorced homemaker, Abigail Burgess-Wynne, the wealthiest woman in town, Margot Matthews, a down-sized marketing whiz, and Liza Burgess, Abigail’s angry and embittered teenage niece, meet at the Cobbled Court Quilt Shop in the fictional village of New Bern, Connecticut, they’ve all had their hearts broken – though for different reasons and in different ways. As the story unfolds, these four special women will discover that, though life is never easy, the thread of friendship is strong enough to mend a broken heart. If you’d like to read a sample chapter from A SINGLE THREAD, the first book in my new Cobbled Court Quilts series, and the book that New York Times bestselling author Susan Wiggs called, "a big-hearted novel…full of wit and wisdom," follow the link to my website, www.mariebostwick.com and click on the book cover. Also, if you register as one of my Reading Friends, you can get a free download for the Broken Hearts Mending quilt pattern, a lap quilt inspired by the one that Evelyn, Abigail, Margot, and Liza make in A SINGLE THREAD. Becoming a Reading Friend is easy, just go to www.mariebostwick.com click on the box that says "Become a Reading Friend…", fill in the information on the registration form (which is never shared with anyone), and submit it. Once your registration is activated, just login, scroll down to the quilt banner under my signature, and click to start the download. 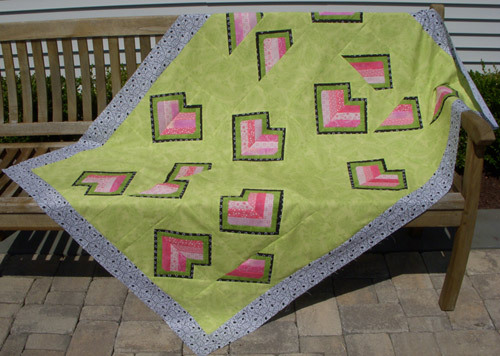 Broken Hearts Mending is a fun and original quilt, perfect to give as a gift, and ideal to use for a group project. And because I bet you like prizes as much as I do (well, maybe not that much. I get excited when a free toothpaste sample comes in the mail), I thought I’d offer an autographed copy of A SINGLE THREAD to one lucky reader, chosen at random, who can correctly identify the event which recently precipitated a conflict between my personal philosophy and my maternal instincts. 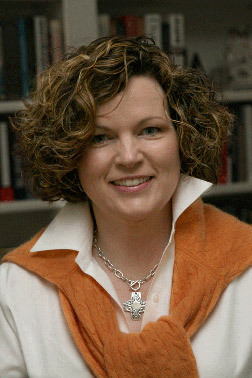 (Hint, to find the answer, go to www.mariebostwick.com and read my February 2, 2009 blog entry.) When you think you’ve got the answer, send me an to mariebostwick@mariebostwick.com. Please put the words "Quilt Blog Contest" in the subject line. I’ll choose a winner from all the correct answers that are sent in by February 17th. Good luck! It was good to chat with you today. Thanks so much, Michele, for inviting me to guest blog on such a special holiday. I wish you and all your readers hearts and flowers, love and laughter, dear friends, good books, and many happy hours spent piecing and stitching…and chocolate. Oh yes. Lots and lots of chocolate. Hi Marie, I just wanted to drop you a line and let you know that Deb Mella is one of my best friends and she has told me a lot about her journey with you in the writing of A Single Thread. I had purchased my copy from her which you did autograph. Thanks for being so kind and having done such wonderful work. Hi Jackie, Thanks for such a nice comment. Deb is a doll. Getting to know her and her story really inspired me. A SINGLE THREAD wouldn’t ring half so true with readers if not for Deb’s input. When you see her, give her a big hug from me! I don’t know where I was, follow you on twitter & for some reason didn’t realize you wrote this book! CONGRATULATIONS! Good morning, Gang. Thank everyone who left comments and who entered the contest. There were quite a few entrants and you ALL sent in the correct answer – I always say that quilters are a bright bunch. The winner, chosen at random from all the entrants, was Shannon Menninger. Congrats, Shannon! You’ll be getting an autographed copy of A SINGLE THREAD. Hope you enjoy it. Loved reading both the blog, this journal entry and the book! Marie is one of my fav authors! See ya next week! Wow. I am totally impressed! Nice work! .-= Brendon’s latest post: Violin lessons. THE LEFT – HAND: PRACTICE =-. i just read your short story THE PRESENTS OF ANGELS. i would like to join your club and get those recipes but i did not see an icon to click on. can you help e with this please? Marie was a guest blogger on my web site. Can you please contact her directly to answer your question. I have searched and searched for the link become a reading friend and cannot find it, I would love to have the recipes in The presents in angels. I so enjoyed the book.